An accompanying website provides powerpoint summaries of each chapter. Please visit: www.textbooks.elsevier.com/9780750685986. Allan Edwards is a Faculty member of Griffith University, Gold Coast Campus, Australia and researcher in the Centre for Tourism, Sport and Service Innovation. He has extensive sport industry management experience and has conducted research and consultancy for national and international sport agencies as well as government authorities. Dr Edwards was previously Regional Secretary of the Oceania region and Executive Board Member for the International Council for Health and Physical Education – Sport and Dance (ICHPER-SD) and International Chair of the Sport Management curriculum com. James Skinner is a Professor in the School of Education and Professional Studies, Griffith University. His research focuses on sport and social and cultural change, drugs in sport, sport and educational policy, leadership in sport and education and globalisation studies. 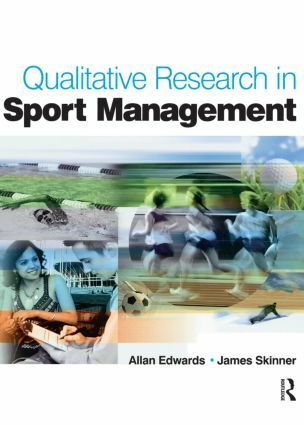 He also has a strong interest in the development and application of qualitative and interpretive research designs in sport and has published in this area.